The 2018 race will again be starting and finishing in Lammas Park (Ealing W5 5JH) where the race and retail village will also be located. The Ealing Half Marathon is West London’s only fully road closed half marathon and multi award winning, making it a must-do in the running calendar. The 13.1 miles will still be run in a single lap, taking in parts of Central Ealing, Montpelier, Pitshanger, West Ealing, Hanwell and St Stephen’s before returning to Lammas Park. We have FIVE official water stations along our course as marked on the route map, please note that we have some very kind people who set up unofficial water stations along the route. 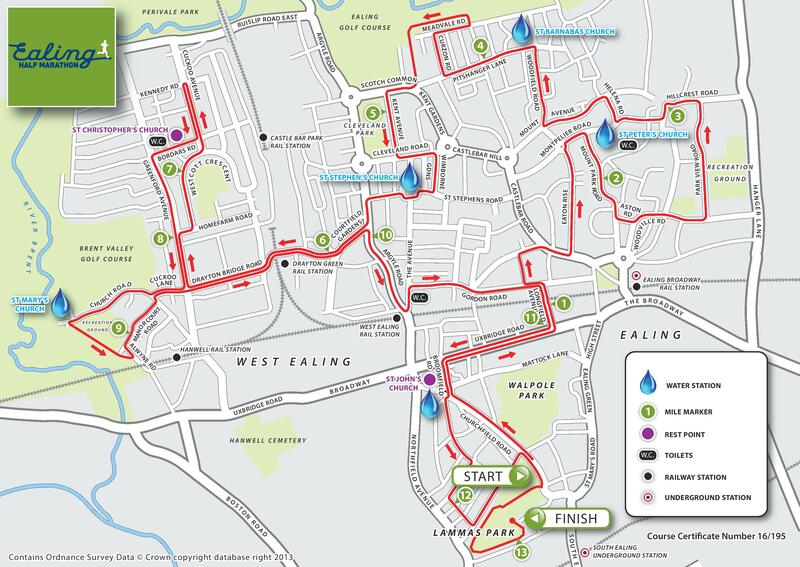 This is a wonderful show of the community spirit that surrounds Ealing Half Marathon but we cannot vouch for any water along the route apart from those at our organised water stations. Our Water Stations are all at churches along the route and will be set up at St Peter’s, at the two-mile point; St Barnabas at four miles; St Stephen’s, after six miles; St Mary’s, Hanwell, at mile nine; and St John’s, Mattock Lane, when runners have a mile to go. We also have the addition of St Christopher’s on Borders Road providing a well needed fuel station with oranges and break-out zone at mile six and a half if you need it. All of the churches involved reschedule their services and, with a number of their flock taking part they will be enter an informal “churches challenge” to keep the #EalingFeeling going.